The Earth is like a gigantic battery that contains a natural, subtle electric charge—a special kind of energy present in the ground. Being grounded also applies to people. Overall, you feel good. If you have pain, you have less of it, or maybe none at all, when grounded. You are in fact a bioelectrical being as all of your cells transmit multiple frequencies that run, for example, your heart, immune system, muscles, and nervous system. With the exception of humans living in industrialized societies, all living things on our planet are connected to the ground’s electric energy. In industrialized societies, you rarely go barefoot outside or wear natural leather shoes that allow you to absorb the ground’s energy. For many decades, people have increasingly been wearing rubber and plastic-soled shoes that act as a barrier to the Earth’s energy, insulating them from electrical contact with the Earth. People also generally don’t sleep on the ground anymore, as many cultures have done throughout history. They live and work above the ground, even far above the ground in high-rises. The truth is, you’re disconnected. You’re ungrounded. You are not in touch with the Earth. Could this disconnection be an overlooked factor in the increase of illnesses in the 21st century? Scientific research over more than a decade indicates that your body can be protected and helped—and that you feel better—when you electrically reconnect to the Earth. That is, when you are grounded. Being grounded can help relieve inflammation. The following images show a 44-year-old woman with chronic back pain, as monitored by thermography, a commonly used imaging method in medicine. The left image was taken before grounding. The red patterns represent “hot” areas of pain and inflammation. When grounded, the diurnal rhythm of the stress hormone, cortisol, begins to normalize. Cortisol is connected to your body’s stress response and helps control blood sugar levels, regulates metabolism, helps reduce inflammation, and assists with memory formulation. The graph on the side shows the results of a study that examined the effects of being grounded while sleeping over the course of eight weeks. 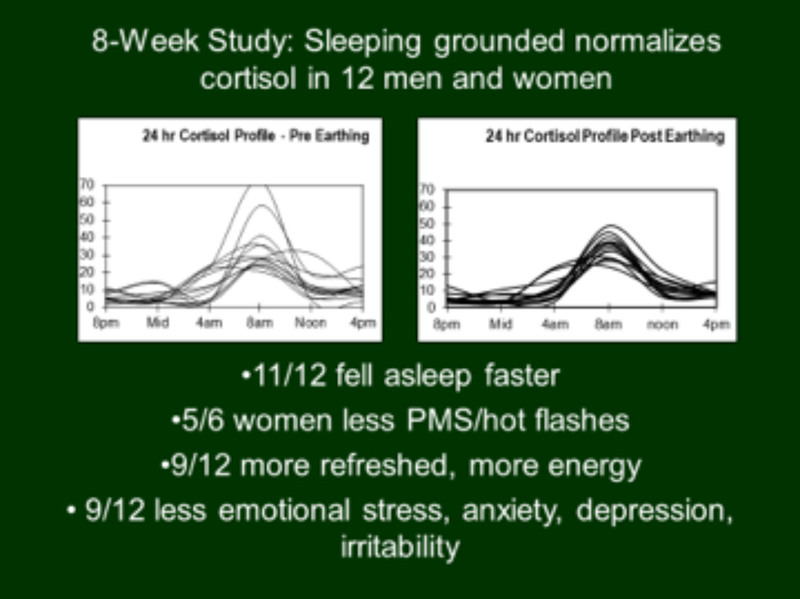 In addition to a normalization of the cortisol rhythm, participants in this study also slept better and woke up feeling more refreshed. When you are grounded, your circulation improves, aiding in the delivery of oxygen and nutrients to the tissues in your body, including better blood flow to your face. 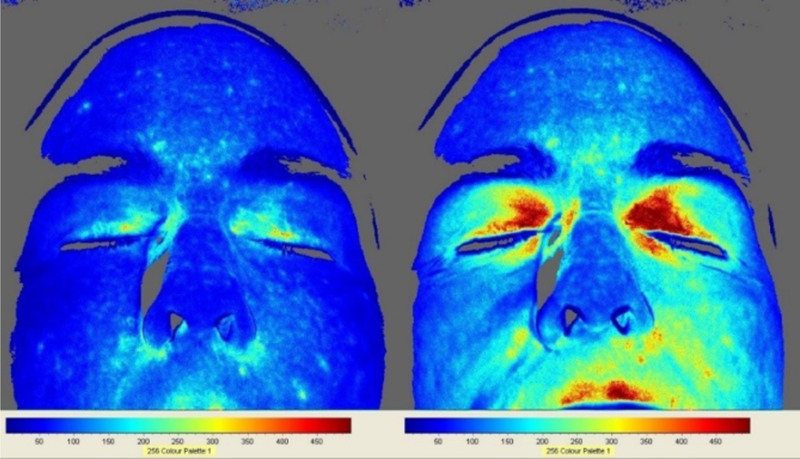 The image below, taken with a laser contrast camera, shows significant facial blood flow improvement within a half-hour of grounding. For many people, however, there isn’t time in their busy days to go out barefoot. So, there are also indoor options. Invest in grounding products—which can be used while sleeping, relaxing, or working. Whatever route you take, get grounded and feel vibrant.